Growing Sunflowers with your kids. Ever wanted to grow beautiful tall sunflowers but no idea how? Are sunflowers all the same? There are giant yellow headed ones that we all are familiar with but there’s also red and orange ones, small ones that grow a bush of flowers instead of one main flowers and there’s multi-headed ones with smaller blooms. My favourite variety right now is the ‘Teddy Bear’ sunflower as you can see its completely different and so beautiful. The space you’ve chosen is weed free, and in full sun as sunflowers love to stretch up to the sunlight. Sow your sunflower seeds around 12cm apart and press them into the soil around 1cm deep. We live in Scotland however and our spring weather can be unpredictable so we prefer to sow them in pots indoors in March and give them a good head start. Should I soak sunflower seeds before planting? Yes, you could soak seeds to help speed germination but not for too long, as soaking the seed in water for too long can actually stop it germinating. A Good rule of thumb is 12 to 24 hours. However, I have never felt the need to soak sunflower seeds before sowing. Whether you’ve sowed your seeds outdoors or in pots the rest of the instructions as simply to water the seeds gently. As they grow, take out the weakest seedlings to eventually leave a gap of 45cm between them. If you’re planting out strong growing potted plants, just plant them 45cm apart. Watch your sunflower grow and grow and grow. 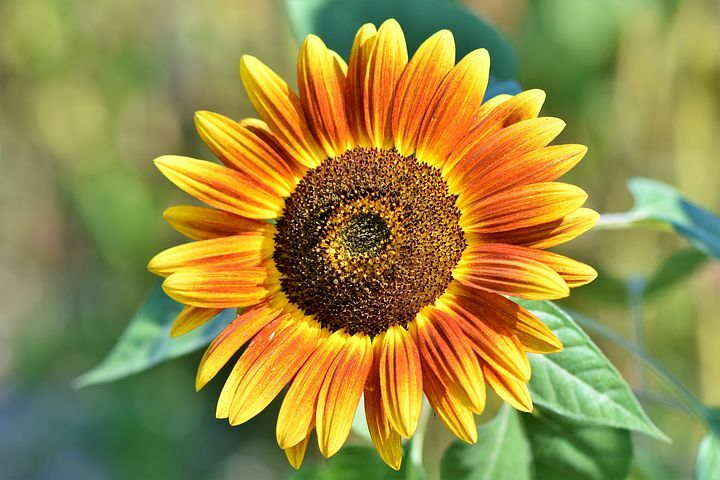 How long does it take to grow a sunflower? Once you’ve sown your seed, cover and keep watered until seeds sprout in 7 to 10 days. When the first true leaves appear (the second set of leaves); thin your plants to 1 plant every 45cm apart. 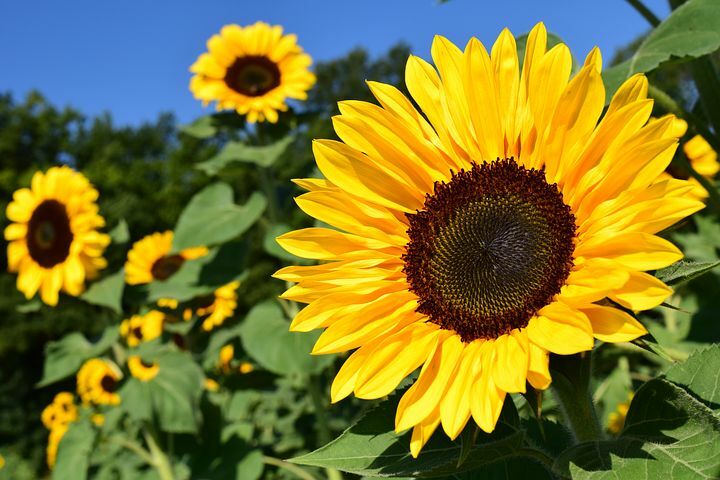 Depending on the variety, sunflowers will mature and develop seeds in 80 to 120 days. How do you grow giant sunflowers? Remember, the more ground you give each plant the bigger the plant will grow. • Feed them well. Then again and then feed some more. • Plenty of water, yes LOTS of water. 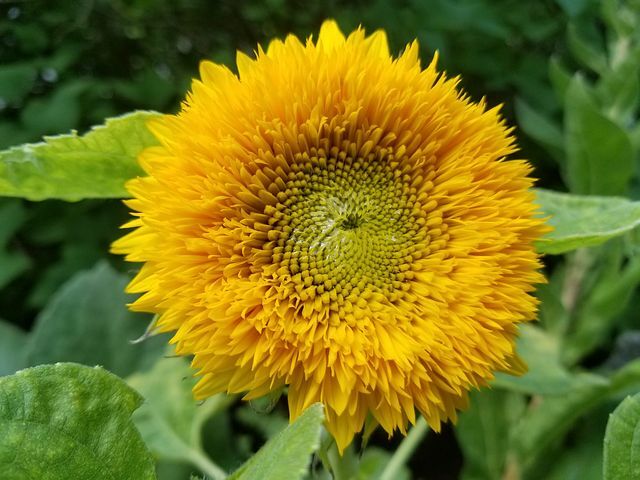 Sunflowers need full sun; 6-8 hours of direct sunlight per day – the more the better if you are trying to grow them to their maximum potential. How much water do growing sunflowers need? They thrive in hot weather with full, all-day sunlight, but they need lots of water to keep them growing well. It’s also a good idea to keep sunflower beds weed free so the weeds don’t use all the moisture from the soil. What should I feed my sunflowers? 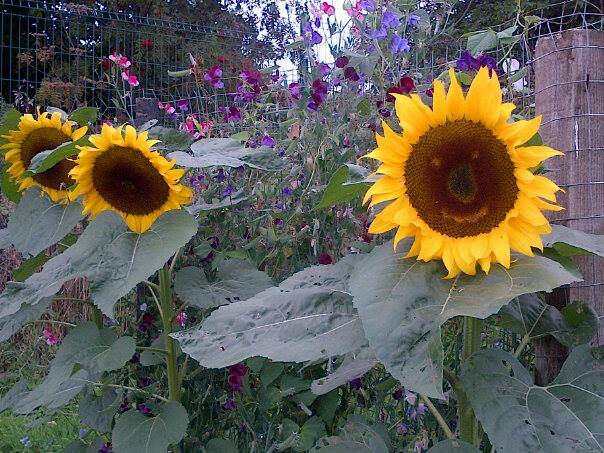 Sunflowers are hungry plants and need a good nutritious diet to help then grow into the tall towering plants we love. Use a general purpose fertilizer to encourage good strong growth. I like to use blood, fish and bonemeal before planting, and I also scatter some chicken manure pellets are are a more slow release feed. Once your flowers start to form, it’s a good idea to use a high potash tomato feed or homemade comfrey tea. Watering it down to the colour of weak tea and water onto your plants regularly. Sunflowers should not need staking, but if high winds are forecast delay watering to keep stems light so they won’t be blown over. What can you do with old sunflowers? You can remove spent flowers to encourage a new flush of smaller flowers. Remove the blooms when the petals have started to wilt. Once cut, leave your old flower in a dry, well-ventilated space to allow its seeds to ripen. You can prevent birds, and squirrels eating all your seeds by cutting and leave to dry indoors or by covering the blooms with paper bag. • Cutting Sunflowers. Cut sunflowers bring bright cheer into your house. In our home the kids like to take large flower heads and rub some of the centre parts of to make faces. These look fab in a vase. • Drying Sunflowers. These flower heads look very statuesque in a vase when dried. • Harvesting Sunflower Seeds. To eat as a snack, to make oil, a coffee style drink or even to feed to the birds are all great ways to use your spent plants. Leave the used flower heads on the ground and birds will feast on them. Sunflower crafts kids can do. While we wait for out seeds to grow, each year we make a sunflower measuring stick and a tall sunflower on the wall to measure them against so we can record all the kids heights as well as the sunflowers. The kids also love making mini sunflowers to label their pot with too. This is a cute craft from Iheartcraftythings. I’d love to know if you have a favourite sunflower craft? So there you go, how to grow your very own sunflowers. What will your kids use theirs for? ?